Expressions of joy echoed through the congregation of St. John’s Cathedral during the Sunday service on September 25, 2011. At this service a letter was read by the Wardens from Bishop Don Phillips announcing that he had appointed Reverend Paul N. Johnson as the Incumbent of St. John’s Cathedral and Dean of Rupert’s Land. His appointment is effective January 16, 2012. St. John’s has been preparing for a new incumbent since their former Dean and Rector, the Very Reverend Bob Osborne, retired in April 2010. The newly appointed Dean is known to the congregation of St. John’s and to the Diocese. 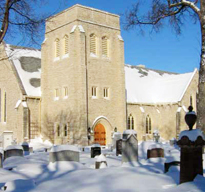 He served as an honorary assistant at St. John’s for several years and is currently serving as Interim Priest of All Saints Anglican Church in Winnipeg. His friendly demeanor, engaging sermons and strong baritone singing voice are appreciated by all who have experienced the services in which he participated. Reverend Johnson is making history. He is the first Lutheran pastor to be appointed a Dean to an Anglican diocese in Canada. Reverend Johnson, in accepting this new appointment, is making history in the Anglican Church of Canada and perhaps the world. He is the first Lutheran pastor to be appointed a Dean to an Anglican diocese in Canada solely under the terms of The Waterloo Declaration (July 2001) which established Full Communion between the Anglican Church of Canada and the Evangelical Lutheran Church in Canada (ELCIC). Reverend Johnson was born in the Australian Territory of New Guinea during a time when his parents were serving as Lutheran missionaries there. He has travelled the world and experienced various cultural and religious traditions and served on national and international councils and conferences with the ELCIC. Reverend Johnson received his Masters of Divinity at Luther Theological Seminary in St. Paul, Minnesota (1987) and holds two Bachelor of Arts degrees (History/Political Science; Biblical Studies) and a Bachelor of Education. He also completed a full year of Clinical Pastoral Education in Winnipeg (2000). He has had numerous pastoral appointments over time at churches in Saskatchewan and Manitoba, including Our Savior’s Lutheran, Regina, St. Mark’s Lutheran, Winnipeg, and the Emerson Lutheran Parish. From 2003-2009 he was Assistant to the National Bishop of the ELCIC. The Dean is one of senior clergy of the Diocese (along with the Archdeacons’) and offers leadership in the Diocese. The Dean is a member of the Diocesan Council and the Executive Committee. In the event that the bishop retires, resigns or is unable to function, the Dean becomes the Administrator of the Diocese since Rupert’s Land does not have any suffragan bishops to take on this role. At this particular point in our history we have identified three areas or spheres of intentional focus for the Dean’s ministry. The first is to “build up the Body of Christ” at the Cathedral so that it has sufficient membership and gifts to fulfill its leadership role in Diocese. The second is the development of the Cathedral as a centre of excellence in worship and education. The Dean will need to take a primary role in the work. The third area involves support and involvement in the Episcopal ministry. The Dean is the primary pastor of the Cathedral congregation (the Bishop’s “home church”) on behalf of the bishop, and therefore works collaboratively with the bishop – providing support and counsel as appropriate. The Dean also functions as a supportive participant in the wider Episcopal ministry of the Bishop and Archdeacons. The congregation of St. John’s Cathedral is looking forward to welcoming Reverend Paul N. Johnson as their new Rector and Dean along with the unique gifts he will bring to these roles.